When I complain about the price difference between six-packs and draft growlers in Portland, I always get comments pointing out that pubs have a different cost structure than bottling breweries. The commenters patiently explain that the only fair comparison is between growler prices and the price of pints or pitchers served at the bar. That makes sense from the business perspective, but at some point the business perspective has to take into account the customer perspective, which just checks the price of beer to-go. In my original rant, I mused that cheaper growlers "could even be a way to boost pub business: sit down for a pint and get a discount on your growler fill". Greenspand-er To-Go Deal! Order a large pizza and growler to-go and get $5 off! In these uncertain economic times it’s nice to know you can still fill up on tasty organic beer and pizza for less than it costs to fill your gas tank. (Gas tank? What kind of talk is that from the bikiest brewpub in town? Oops, sorry, wrong rant.) That $5 off is the kind of deal I've been looking for. Let's do some creative accounting, and knock all the savings off of the beer rather than credit some to the pizza. 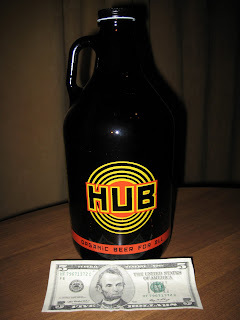 That gives you a $10 Hopworks growler for $5 -- a six-pack equivalent price of $5.63. That's a good deal these days. I haven't taken advantage of the Greenspander yet, but I love the idea. It's that kind of thinking that can help brewpubs get more of the beer-at-home market. Oooh, I have a plan! 1) order a cheeseburger to go. 2) Buy discounted growler, place reverently in trunk. 3) take food across street to Vino Vixens and get two glasses of House wine, happy hour price is $2 a glass. 4) Eat food and drink wine. 5) Take beer home and drink it all week. Mary Sue: Is Vino Vixens a fun place? What's the house wine? Sounds like you have a good plan (except as far as I know, the deal only works with pizza).